Chapter 11 bankruptcy filings in the U.S. retail industry aren't as rare they as in other industries due to the inherently volatile nature of retailing and restauranteering. 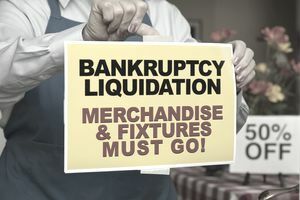 But since the Great Recession, the pace of Chapter 11 bankruptcy filings by U.S. retailing companies has accelerated, and the number of retail companies that end up hosting Going Out of Business sales after their Chapter 11 filings has increased. Chapter 11 is intended to be a "reorganization" remedy for businesses, which means that the retailing and restaurant companies that file Chapter 11 are not necessarily "bankrupt." What it does mean is that these retail and restaurant companies with Chapter 11 filings need a court-protected grace period in order to reorganize and restructure certain aspects of their business and return to profitability. Chapter 11 is the pause button that some retail businesses need before so that they can reboot and return to profitability. Unfortunately, trend in recent U.S. retail history has been for Chapter 11 filings to be the beginning of the final chapter for most retail and restaurant chains that have no other options. Rather than admitting complete defeat and filing Chapter 7 full bankruptcy papers, optimistic, perseverant and stubborn leaders choose a Hail Mary Chapter 11 Hail Mary as their last effort to keep their company alive. As in all games, the Hail Mary pass is a thrilling demonstration of full out effort to the end, but more often than not is, in fact, the end. What follows is a complete historical timeline of the major U.S. retail industry companies that have filed for Chapter 11 bankruptcy protection which resulted in going out of business liquidation sales, the closing of all retail operations, and the end of their retail brand. BOOKMARK THIS PAGE for ongoing updates as Chapter 11 bankruptcies are filed. This list was last updated on October 31, 2015. After 156 years in business, one of the oldest U.S. retail chains still in business filed Chapter 11 bankruptcy in July, 2015. In 2015 the Cache luxury fashion retail chain filed Chapter 11 bankruptcy for the second time in its history. Closed 15 stores on December 26th, and re-opened the stores on January 20, 2009 for liquidation sales. The company had assets of $9.7 million against debt of $54.4 million. The U.S. bankruptcy did not affect the 70 Plastinina stores in Russia.